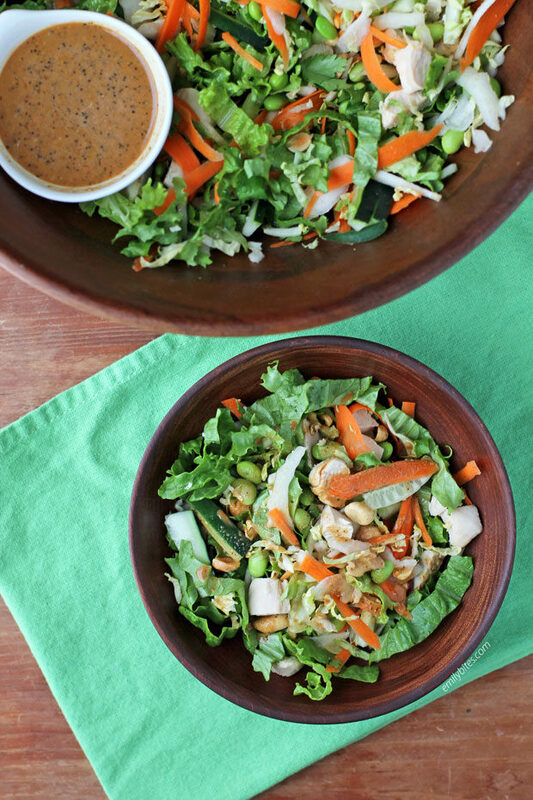 This Thai Chopped Chicken Salad with Peanut Dressing is bright, fresh and filling with a savory peanut dressing that will have you swooning! Chock full of ingredients, this is no boring, wimpy salad. Fresh lettuce, crunchy cabbage, chicken, carrots, cucumber, edamame, peanuts, this salad makes an amazing lunch or unique dish for a brunch or potluck. You could also pair this with a cup of soup for a satisfying dinner! Plus, the peanut dressing tastes positively sinful, but uses PB2 (powdered peanut butter) which lightens it up dramatically! I find most stores by me carry PB2 (or similar brands) now, but if you have trouble finding it you can always order it on Amazon. 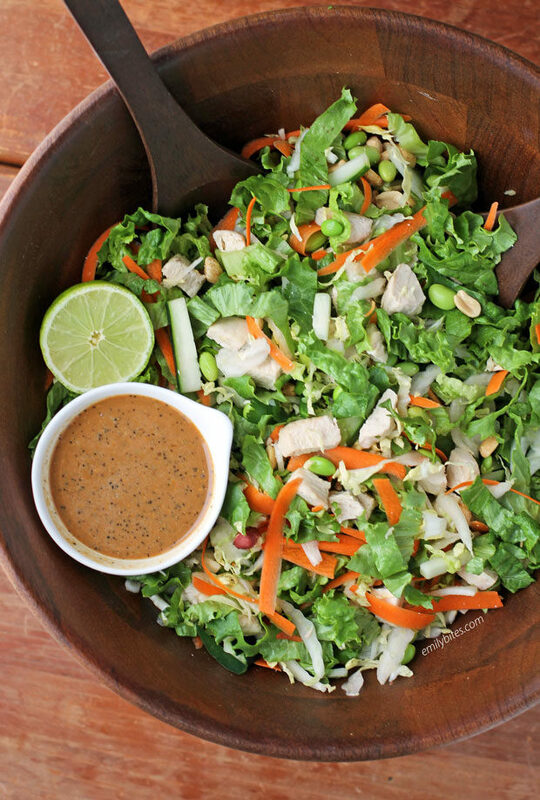 Not only is this dish fresh and flavorful, but each serving of this Thai Chopped Chicken salad is just 269 calories or 4 WW Freestyle SmartPoints! Toss the salad ingredients together in a large mixing bowl. In a smaller mixing bowl, whisk together the dressing ingredients until smooth. Keep separate until ready to serve. Each serving is about 2 & 1/3 cups of salad and 1 ½ tablespoons of dressing. Hi Emily, I have never seen powdered peanut butter, may I substitute regular pb? Yum! I can’t wait to try this next week for lunch. 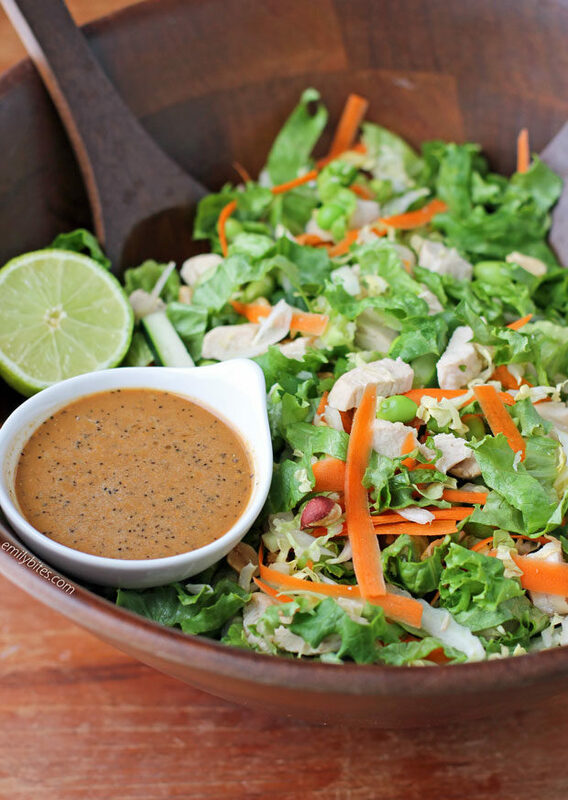 My new favorite salad – the dressing is amazing! Thanks for this recipe, Emily! I am in love with the dressing and so surprised how easy/what a difference homemade salad dressings make! Oh my goodness I made this dressing last night for meal prep for the rest of this week. I ate it over a bed of bagged coleslaw with grilled chicken, sunflower seeds, and some wonton strips – SO SO delicious! This dressing will get made once a week for a while! I love the dressing. My family loved it more than the salad though. I also used it as a chicken dip.